As you soon find out if you spend any time on the web, web pages are full of cumbersome advertisements. They often get in the way. How would you like to strip the ads from the web pages you visit? You can do that by installing an app from the Microsoft Store called Adblock Plus. 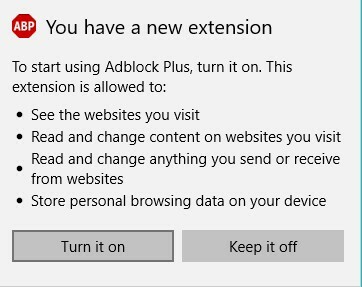 Close Edge, go to the Microsoft Store, and install Adblock Plus now. Installing takes only half a minute. The first time you open Edge after Adblock Plus is installed, you see the message screen. Select the Turn It On button. Then go to a web page of your choice. View a web page after Adblock Plus is installed. Notice the large ad at the top of the first Edge screen. This ad is absent. After you install Adblock Plus, the Adblock Plus button (with the letters ABP) appears in the upper-right corner of the screen. 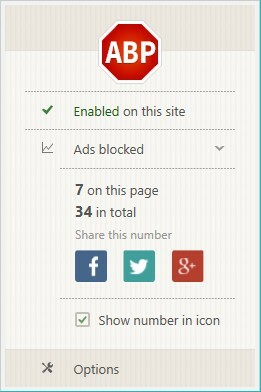 A number next to the button tells you how many ads were blocked on the web page you’re visiting. You see a drop-down menu. It also tells you how many ads were blocked. If for some reason you want to see ads on a web page, open the drop-down menu and select Enabled on This Site to disable Adblock Plus. You have to select the Refresh button in Edge (it’s located next to the Home button) to see the ads. Click or tap anywhere on the web page to close the Adblock Plus drop-down menu.